This post is reblogged from 2011. It's our editor Adam with his love letter to Big Ben. Happy New Year to you all and we look forward to seeing you both here on this blog and "out there" on a London Walk in 2015. Regular Daily Constitutionalists will know that we are posting a Christmas card from London on our blog every day until Christmas Eve. Henry Cole is the man credited with originating the tradition of the Christmas card, but there's a whole lot more to the man than that. A merry old soul, think you? How’s the nursery rhyme go? Well, I don’t know about merry. And it may be a stretch to see him calling for his pipe and calling for his bowl. I’d say he looks like he means business. Looks earnest. Determined. Looks like he’s taking stock. Looks – in a word – Victorian. His name is Henry Cole. And this is as good a time as any to meet him. 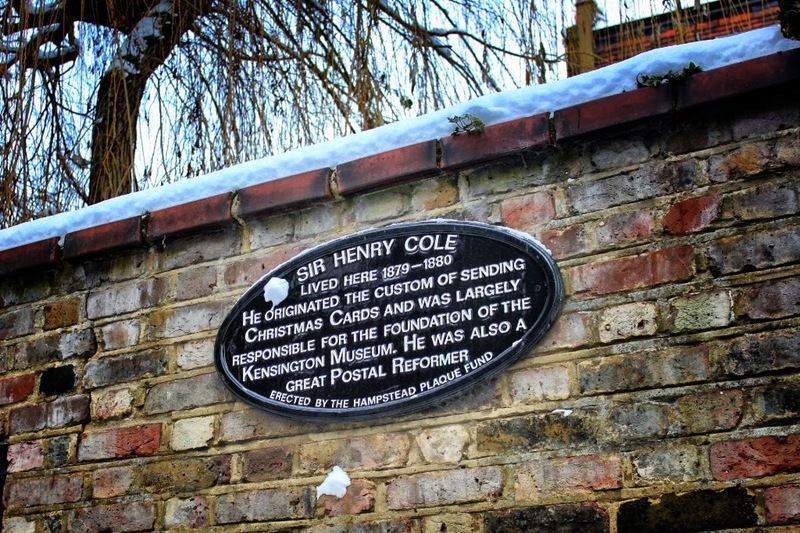 Because amongst other things – amongst many other things – Henry Cole invented the Christmas Card. Here’s the very first one, the Ur Christmas Card. It went out in 1843. 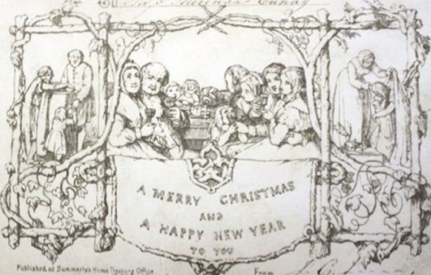 Ok, it was 177 years ago and for sure Christmas cards have changed a bit. Not just colour – they’re all-singing, all-dancing digital these days. Well, some of them are. That said, the essential elements are here. In this first ever Christmas card. Christmas of 1843. * There’s family and food and drink and a festive time being had by all. The Christmas card’s just an entrée. Of much greater interest is King Cole himself. And what he accomplished. The difference he made. And yes, they really did call him King Cole. It was an acknowledgement of his power in the small kingdom of South Kensington. 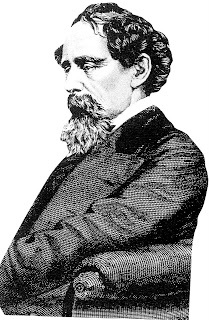 He was born Henry Cole. (He died Sir Henry Cole.) The bookend dates are 1808 and 1884. He started life in Bath. Son of an army officer, he was educated at Christ’s Hospital school. Upon leaving school he got a job as a clerk, in the Record Commission. Fell out with his employer over his, Cole’s, salary. Decided to tip the whole damn apple cart over. The Record Commission at the time was a hotbed of corruption and jobbery. Cole went public with the shenanigans. 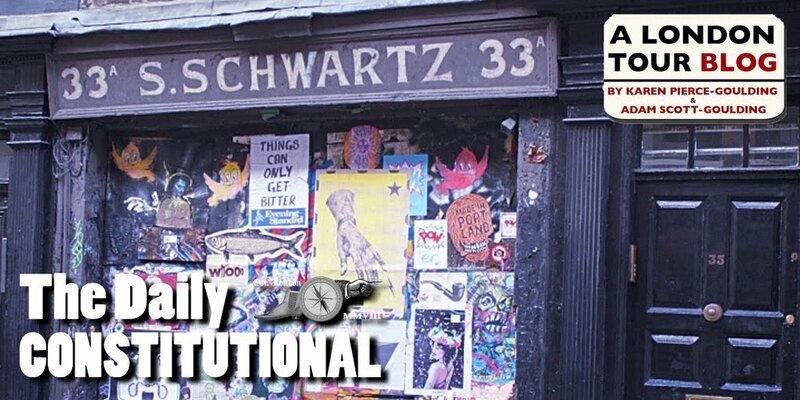 An unlimited dirty linen hangout in a series of articles for The Examiner. Cost him his job. Temporarily. Parliament was embarrassed into doing something about the mess and when the reforms were put in place Henry Cole was reinstated. The important thing – the big picture thing – was that he’d found his calling. He was formidable. Wouldn’t be put off. Had some vision. Was one of the great organisers of the age. Abilities fuelled by boundless reserves of energy. Here’s a checklist. The London – and indeed the country, the culture – that Henry Cole built. I think you’ll agree the Christmas card was small beer in comparison with the biggies in this list. 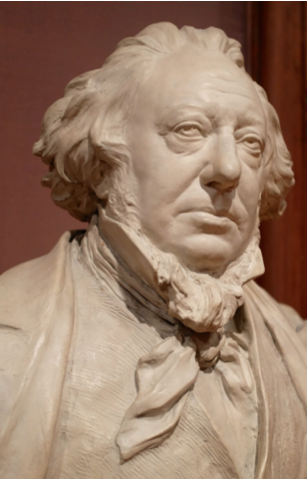 • Along with Rowland Hill, Henry Cole was the prime mover behind the introduction of a national prepaid postage system. • He was a mover and shaker in the world of Victorian railways. Produced a series of railway charts and wrote articles on railway excursions. Campaigned for the introduction of the uniform narrow gauge and the separation of freight from passenger traffic. • Authored a series of illustrated children’s books. And campaigned for an adequate education and good occupational opportunities for girls. • Was at the centre of the group that organized the 1851 Great Exhibition. He was promoter, publicist and administrator. He was the guy who sorted it. Allocated space for the 14,000 exhibitors from Britain, 11 colonies and 14 foreign countries. • Then led the fight to save the Crystal Palace from dismantlement after the GE was over. • The Great Exhibition turned a healthy profit. The money was used to buy land in Brompton, just south of the Great Exhibition site in Hyde Park. Prince Albert, the Great Exhibition’s royal figurehead hoped the site could be used to carry on with the work of the Great Exhibition: “the promotion of industry and the arts.” Henry Cole was the man who turned the vision into reality – he spent the next 20 years of his life turning South Kensington into a national centre for the arts and sciences. The V & A, the Natural History Museum, the Science Museum, the Geology Museum, etc. – it’s surely the greatest museum complex in the world. We’ve got Henry Cole to thank for it. • He did important work for the schools of design that had been set up in the 1830s. Just for the fun of it he designed a tea service that won a Society of Arts prize. • After “retirement” he set up the National Training School for Music. And the National Training School for Cookery. 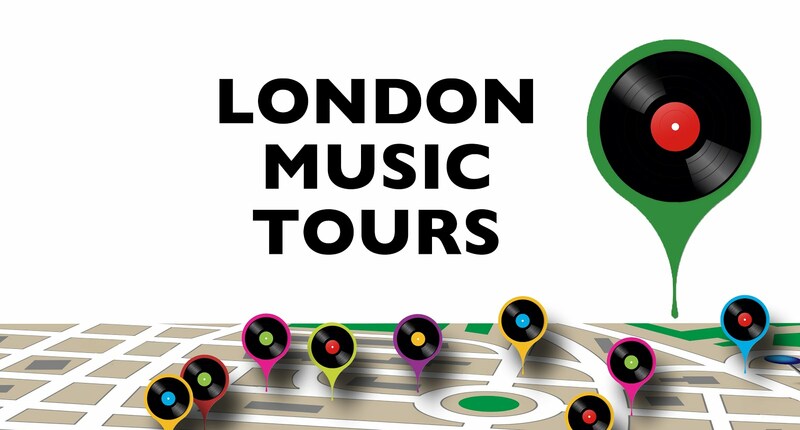 • He was the driving force behind “the nation’s village hall” – the Royal Albert Hall. Sewage, army reform, copyright, patent law also came under his purview. In his spare time, that is. *That may have been the second most memorable Christmas of all – because it was also the year of Dickens’ novella, A Christmas Carol. 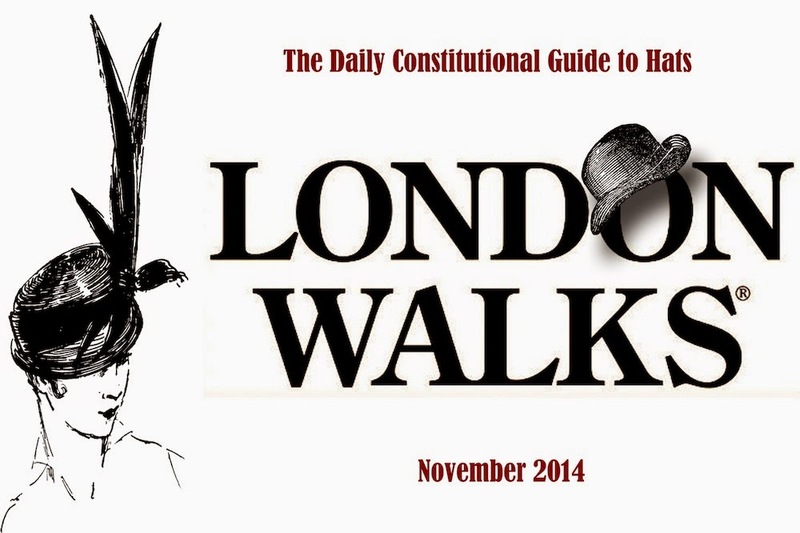 With winter on the way, the thoughts of London Walks guides and London Walkers inevitably turn to… warm clothes! A while ago we blogged about our favourite walking shoes – you can catch up with our recommendations HERE. This month, we're at the other end of the spectrum: hats. 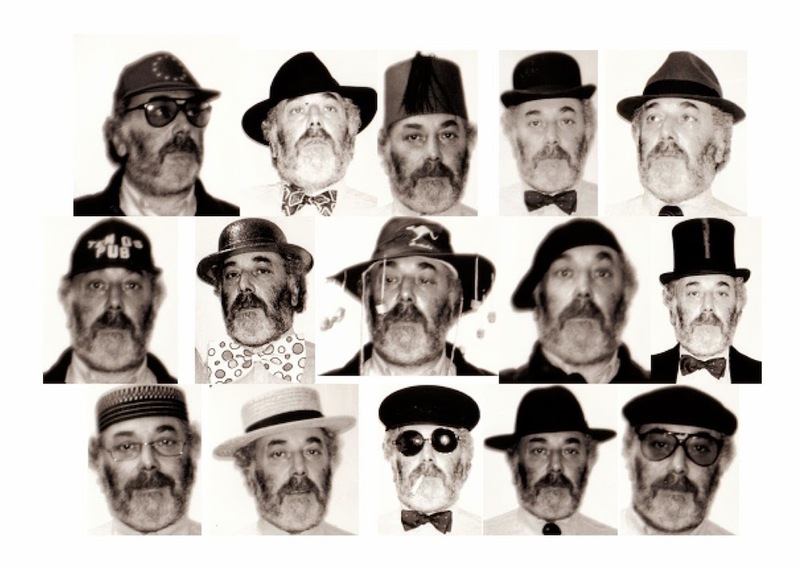 Harry Jackson is first up, reminding us of the old maxim, "If you want to get ahead… get FIFTEEN hats." We're particularly fond of these pics. They look like the gallery section in the biography of some illustrious spy where we get to see the master of disguise in full spate. For preference? We think the beret is tops. Although, paradoxically, the top hat is also "the berries". Harry adds, enigmatically… "There are some of us who just suit a hat. Sadly, there are some who don’t." Harry, there's only one possible response to this: we take off our hat to you… 15 times. Can you recommend a good hat? A good hat shop? Or do you just have a face for hats? Send us your thoughts, send us your pictures please! Harry is a Cockney, a Scouser, a character - how could he be otherwise? - and a professionally qualified Blue Badge Guide.